The VAMPIR KL 690 has been designed to speed up snow clearing operations, while also minimising the airport’s carbon footprint. Kahlbacher’s latest winter services concept is the Airport VAMPIR KL 690, which has been designed to speed up and improve snow-clearing operations during the winter season. While the product is focused on manoeuvrability, maximum stability and resistance, in fitting with the industry’s strive towards carbon neutrality, it also has a low carbon footprint. The optimised multiple-blade design allows for energy-saving snow removal, while the optional Eco Clearing Rail allows for the reduction of de-icing materials by up to 20%. Furthermore, the pressurised release of the blades leads to lower resistance and, therefore, less fuel consumption, while the low front axle load increases traction for more effective steering. Safety is also at the forefront of the design of the VAMPIR KL 690. With an integrated overrunning protection system, immediate automatic reaction to obstacles returns the plough to the clearing position after overrunning an obstacle, while the electronic control enhances the safety through the supervision of all functions. 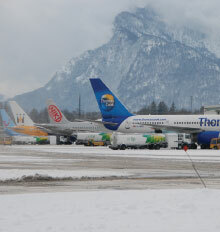 During the 2009/2010 winter season, which saw some of the most severe weather conditions across much of Europe for the best part of a decade, Kemira supplied the airport industry with a range of organic salts designed to ensure the required friction for traffic operational surfaces. The organic salts – based on acetic and formic acids – and the range of runway de-icers, prevent ice and snow build-up in a safe and environmentally responsible way. Kemira Clearway products are also readily biodegradable, and are not water endangering. Throughout the manufacturing process, Kemira places an emphasis on chemical purity and the highest standards of quality control, adding to the company’s corporate reputation for consistency and quality, backed up by its ISO-9002, ISO-14000 and ISO-18001 certification. Proviron Industries has launched a new formate-based de-icer in anticipation of increased demand among European markets. The Provifrost KF Liquid Potassium Formate de-icer is the third runway de-icer from the company, all of which are designed in an environmentally sustainable manner. The de-icing fluid biodegrades easily at low temperatures, requiring less oxygen to do so in comparison to similar urea and glycol-based chemicals. Therefore, this reduces the risk of contamination of local water systems. 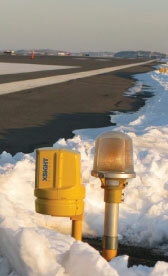 Provifrost KF can also be used as an anti-icer to prevent the formation of ice on runways. By creating a film on the top of the surface, it prevents ice and snow from bonding with the surface, making it significantly easier to remove. The other two products in the Proviron airport de-icing portfolio are the Cryotech E-36 and the Crotech NAAC, both of which are easily biodegradable and effective to temperatures beyond -50ºC. Scarecrow Bio-Acoustic Systems is launching the Ultima Version 3 bird dispersal product. The unique tablet computer system has a 21cm touch-screen display and can be used to present a database of bird recognition information, including full screen illustrations to aid identification. The complete system includes roof mountable loudspeakers, tablet mounting brackets, a microphone for live announcements, a back-up control unit and hot-pluggable USB flash drives to enable captured data to be transferred from the vehicle to the airfield analysis system. The software-driven basis of the product also means that subsequent enhancements to the product can be delivered via a USB flash drive upgrade. 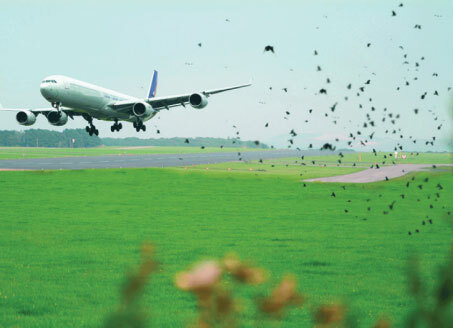 The company already provides bird control and dispersal products to more than 1,500 airports globally, including a number of major airports, such as London Heathrow and Vancouver International Airport. Bird Control Italy has developed its own unique software system for bird strike management. The innovative system can be utilised on a dedicated website, which generates a risk coefficient regarding the presence of birds in aerodromes. The Bird Strike Management System is customised for the needs of individual airports and each bird control unit operator supplies information to the database. Consequently, the software system becomes a tool to manage, store and consult a collection of submitted bird strike monitoring and reporting forms. The system also enables the extraction of information from the database relating to bird strikes that have occurred over the course of the year in the format required by ICAO, which can then be submitted to the ICAO Bird Strike Information System. In addition, Bird Control Italy also sends all users an annual report of all the information collected.